Do you have an untreated cough that has lasted for several weeks? If so, you are not alone. Many patients in my practice have been complaining about a cough that does not seem to go away. I have seen more of it this year than in other years, and it started back in November of last year. The cough may be “productive” (producing mucus), or it may be “dry.” It can occur during the day, when you’re lying down at night, or throughout the night. In more severe cases, the cough will come in “volleys” (paroxysms), and will awaken you, or even frighten you. It may be associated with a post nasal drip or gastric acid reflux. Some medications, particularly some of the medication used for the treatment of high blood pressure, can cause a persistent, dry cough. The underlying reason for the cough is an inflammatory process which affects the linings of the bronchial tree leading to the lungs. It’s similar to the process responsible for bronchial asthma. It is thought by some authorities that, when left untreated, this condition can leave you predisposed to a recurrence, or even trigger the new onset of asthma. When the cough lingers, you should be examined by a physician. This is especially important if you have a chronic condition such as asthma, chronic bronchitis or heart disease, and even more so if you have an impaired immunity, take immune suppressing medications, or are a smoker. 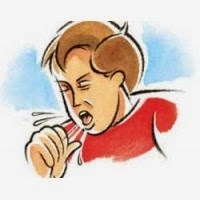 In treating the persistent cough, the physician must make sure that conditions other than post infectious cough are ruled out, such as pneumonia, asthmatic bronchitis and the whooping cough (pertussis). Once other causes have been ruled out or treated, the post infectious cough will resolve on its own. But it may take weeks, and I have seen it last for months. Treating it will generally shorten the duration and severity of the post infectious cough, and should make you feel better much faster. So, when you develop a lingering cough, don’t just tough it out, have it evaluated medically, and treated if necessary.